When most people think about skin cancer, they normally picture fair-skinned people who spend a lot of time in the sun. They remind themselves to lather up in sunblock before going to the beach, the golf course, or even out for a walk. Skin cancer is responsible for 40% of cancer cases worldwide in humans. We rarely, though, think about our pets being susceptible to skin cancer – but they are. The sun is incredibly powerful. Cats, like humans, can fall victim to skin cancer from extended exposure to the sun’s rays. In fact, skin cancer is the second most common cancer in cats. Epithelial tumors – which form on the skin itself or in hair follicles. The most common skin cancers in cats are basal cell tumors (also the most common skin cancer in humans), squamous cell carcinoma, mast cell tumors, and fibrosarcoma. Is My Cat at Risk for Skin Cancer? Technically, any cat is at risk to develop skin cancer. While many people know that exposure to the sun increases the chance of developing skin cancer, some skin cancers appear for no discernable reason. There are certain factors, though, that can increase the likelihood that your cat will develop cancer. Cats who spend most their time outside – and therefore have extended exposure to the sun – are more at risk. Cats with light fur – especially those with white fur – are more at risk due to the fur’s inability to block harmful solar rays. What Does Skin Cancer in Cats Look Like? Sores: If your cat develops a sore that does not go away, or a sore that bleeds but does not fully heal, it may be a sign of skin cancer. Growths: Any growth or tumor on your cat should be examined by a vet. A growth in an area where the cat’s hair has turned white is likely a pre-cancerous or cancerous growth. Changes in Skin or Hair: Bowen’s disease is an early form of skin cancer that reveals itself through a section of the skin that changes color and develops an ulcer in the center, crusting near the sore, and hair falling out around the sore. If your cat is showing any of the symptoms above, schedule a visit with your vet immediately. Unlike some other cancers, skin cancer has a high rate of recovery if caught early enough. Your vet will perform a few tests to determine if your cat’s tumor is malignant, including a biopsy on a removed portion of the tumor, cytology – a microscopic examination of the tumor cells, a blood count, a serum chemistry panel and a urinalysis. 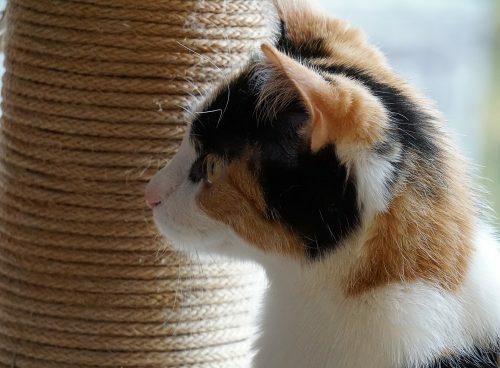 If your cat’s skin cancer is detected early – before the cancerous cells have spread to other parts of the body – there are a few options for treatment that result in a good prognosis. The first and most common is surgery. If the tumor has not spread, your vet will remove it and some tissue around the tumor as well. If the tumor cannot be removed for any reason, radiation therapy may be performed to shrink the tumor and destroy the cancerous cells. If the tumor is very small, surgery may not even be necessary. Cryosurgery – where the tumor is frozen off, may do the trick. The best thing you can do for your cat to avoid deadly skin cancer is to continuously monitor your cat’s skin and overall health. If possible, limit the amount of time your cat spends outdoors, especially if he has light colored fur. A little awareness goes a long way.